Futures Thinking for Social Foresight (FTSF) brings together a range of tried and tested resources for helping young people to develop a wide range of futures concepts and capabilities. 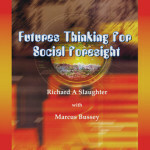 Some of the material presented here has been drawn from two previous resource books: Futures Tools and Techniques and Futures Concepts and Powerful Ideas. The former was first published back in 1987 and the latter in 1991. The best of this material was up-dated and revised for this publication and new, more recent, material added. 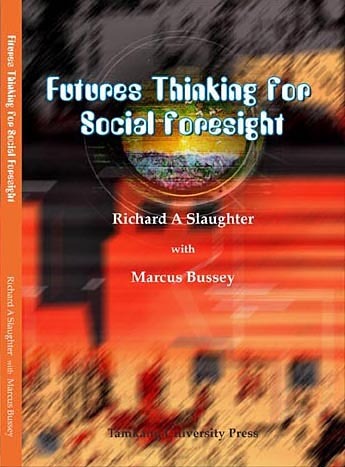 Written by two experienced educators it provides a unique and straightforward introduction to Futures Studies and Applied Foresight for junior and secondary students. The entire contents are copyright free for teachers and students and can therefore be reproduced within schools as necessary. (This obviously excludes re-publication in any medium.) The work is available in PDF form both as a whole and in separate sections. It is also available as a CD-ROM. Both are available in the Shop section of this site. The book and CD-ROM are divided into five sections: Mapping Futures Studies: Key Concepts; Contexts and Applications; Futures Concepts and Related Techniques; Methods; and finally, Futures Thinking for Social Foresight. See below for the free Introduction, Glossary and Author Biographies.